All 1968, 1969, and 1970 428-equipped Mustangs and Cougars used a 24-inch radiator fan shroud to concentrate air flow between the radiator and the cooling fan to make the cooling system run more efficiently. The fan shroud is designed to enclose the core area so that when the fan is spinning, air flows through the entire surface area. This greatly increases the radiator's ability to transfer heat. The fan shrouds themselves are a type of fiberglass and were manufactured by Barnum Brothers Fibre Company of Michigan, who was a supplier to the major car manufacturers of the time. 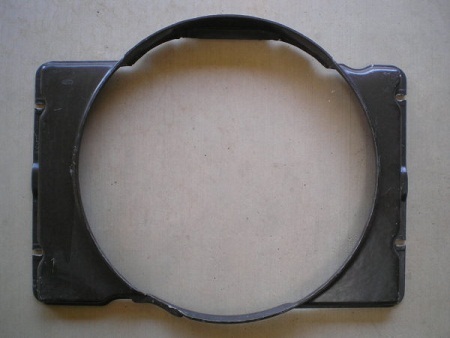 Ford's part number for the fan shroud is C8ZZ-8146-A. There are two distinct variations of the fan shroud that are identified by the engineering numbers C8ZE-8146-A and C8ZE-8146-C. 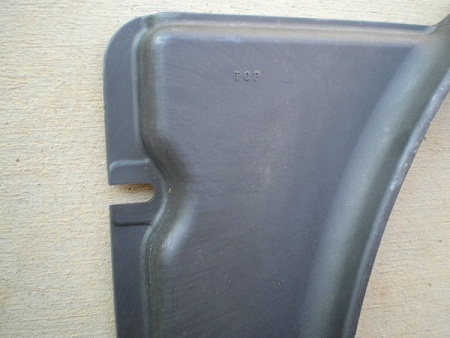 The C8ZE-8146-A version was the original design shroud and would have been installed on the 1968 428 equipped cars. It is simply identified with the word TOP molded in the top left and the edge molded with a large square FoMoCo logo, C8ZE-8146-A, and Barnum Bros. Fibre Co., Inc. 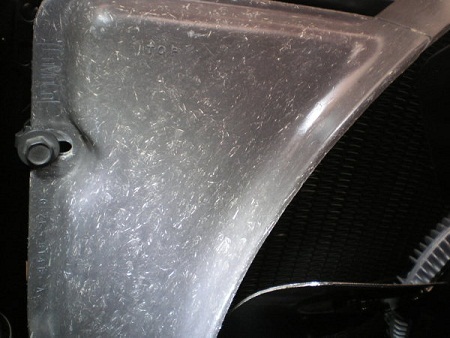 The major difference between the -A and -C version shroud is the reinforcement area around the lower radiator hose. The mold for the -C version was slightly changed by Ford probably due to breakage/warranty complaints and supplies more reinforcement in this area that is prone to cracking. For the C8ZE-8146-C shroud there are three distinct versions, with the difference being in the markings/logo and the fiberglass texture of the shroud itself. 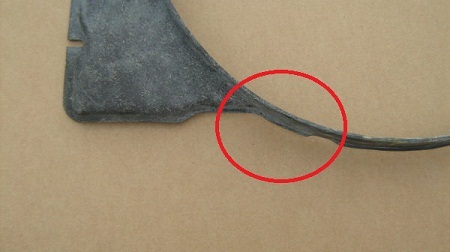 The markings are located on the top driver's side of the fan shroud. 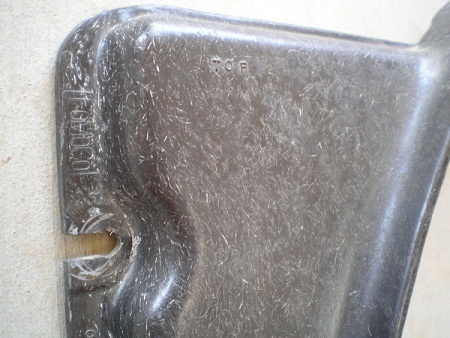 The first version, which probably appeared in early 1969 models, is identified with the word TOP molded in the top left and the edge molded with a large square FoMoCo logo, C8ZE-8146-C, and Barnum Bros. Fibre Co., Inc. The texture is commonly referred to as a horse hair texture, which has numerous large glass fibres as opposed to later versions which are smooth. 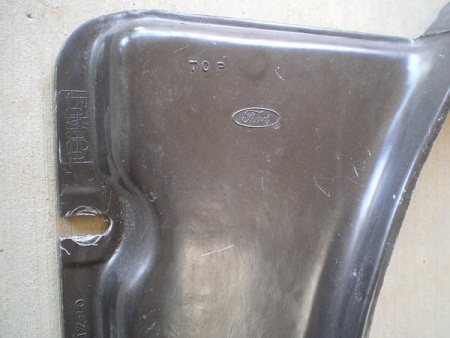 The second version, which appeared either in very late 1970 production or only as a service part, now has the oval Ford logo in the top left in addition to the word TOP. This period was when Ford was phasing out the block FoMoCo to the oval Ford logo. 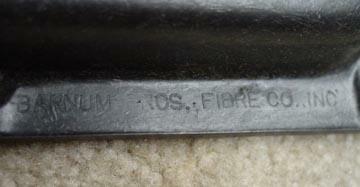 The edge is molded with a large FoMoCo that is now is lined out, C8ZE-8146-C, and Barnum Bros. Fibre Co., Inc. The texture would still have been a horse hair texture. 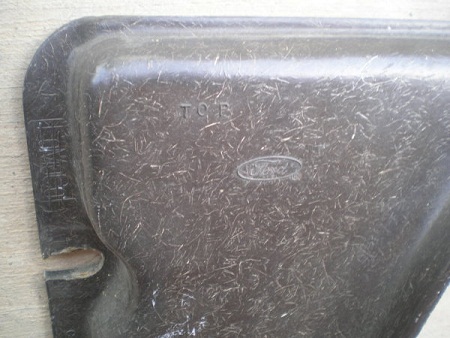 The third/service version, which is the service replacement which was sold at Ford dealerships up into the 1990s, has the oval Ford logo in the top left and the word TOP. The edge is molded with a large FoMoCo that is lined out, C8ZE-8146-C, and Barnum Bros. Fibre Co., Inc. The texture of the fiberglass on these fan shrouds now is a smooth texture with no glass fibres visible anymore and the shroud feels slightly more flexible. Fan shrouds with a lined out FoMoCo on the side are considered service replacements as they would not have appeared in regular assembly line cars, except possibly on some of the last built 1970 Cobra Jets. 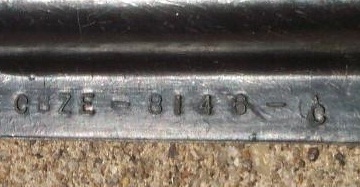 Here's a closer view of the -C engineering number and "Barnum" markings. C8ZE-8146-C Engineering Number Barnum Bros. Fibre Co., Inc. The current reproduction version available today is manufactured by Daniel Carpenter Mustang Reproductions and sold through various resellers. The shroud seems to be an exact copy of the -C version with no FoMoCo markings/logos except for the word TOP. 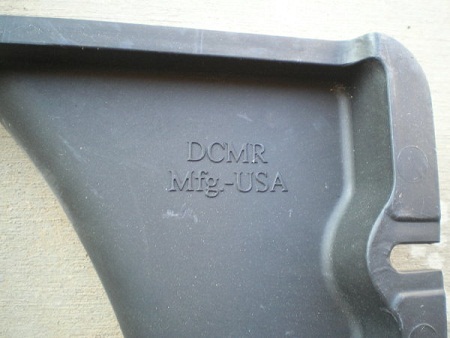 The back side has DCMR Mfg. USA. 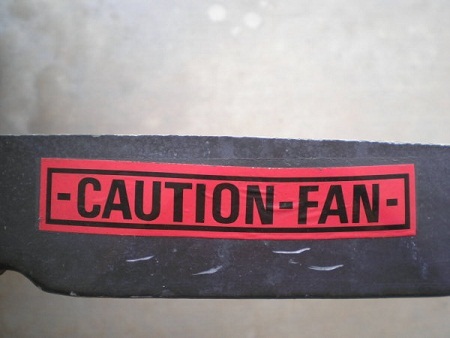 One important note: The only fan shrouds that ever came with a "Caution Fan" sticker were the service replacements. This may have started in the mid-1970s. 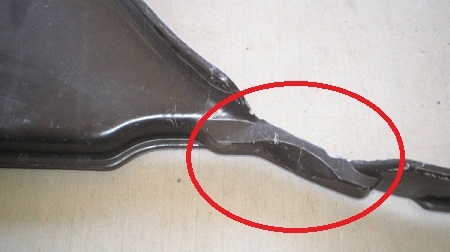 This sticker was not placed on the fan shroud for factory assembly during the 1968 to 1970 model years. There have been discussions that they may have been placed on cars by the dealer when the vehicle came in for service at a later date, possibly related to a service bulletin.